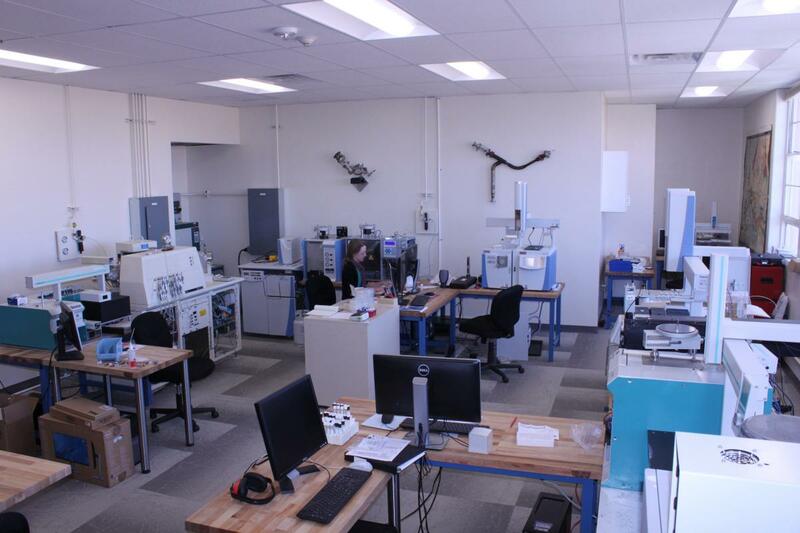 UNM–CSI consists of four newly renovated climate-controlled rooms (~2500 ft2) equipped with seven isotope ratio mass spectrometers, one quadrupole gas chromatograph mass spectrometer (GC-MS) system, and laboratory space for processing a variety of samples for isotope analysis. Below is a short description of each instrument and their current peripheral configurations. UNM–CSI is also equipped with a full glass blowing facility, a small mineral separation facility, including micro-saws, a magnetic separator, microscopes, dissecting equipment and heavy liquid-acid digestion facilities, five Sartorius microbalances, three convection drying ovens, a high-temperature muffle furnace, hot water bath, sonicator, freeze-drier, and a number of centrifuges for processing a variety of geological and biological samples. 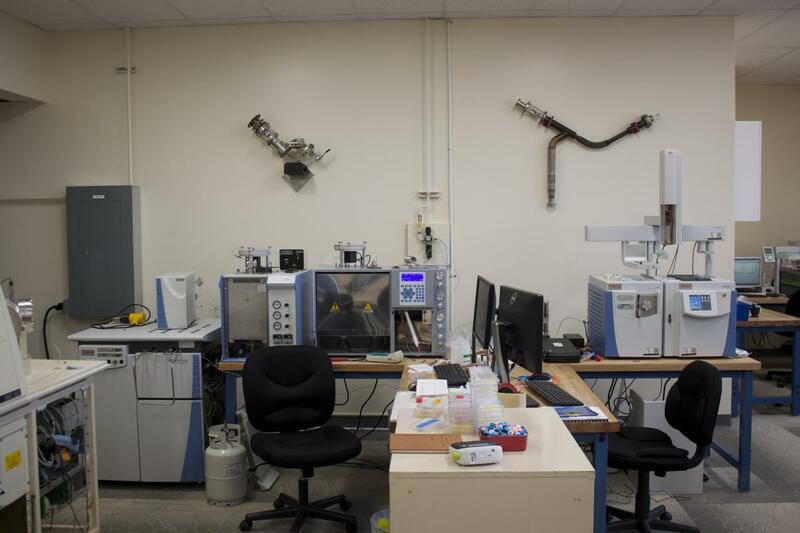 Laboratory space (~2000 ft2) for sample preparation is located in Northrop Hall 333 (Earth and Planetary Sciences) and Castetter Hall 235 (Biology). Contact Zach Sharp or Viorel Atudorei to use the facilities in Northrop Hall and Seth Newsome to use the facilities in Castetter Hall. 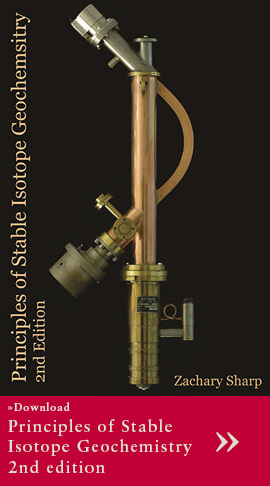 In addition, UNM–CSI has a radiocarbon (14C) preparation laboratory under the direction of Keith Prufer (Anthropology). The recently acquired 253 mass spectrometer is specifically configured for triple oxygen isotope analysis, with narrow cups aligned for masses 32, 33, and 34. Two extraction lines are connected to this instrument. The first is a 'conventional' laser fluorination line for milligram-sized samples. It is equipped with a GC column to purify the O2 gas, which is then admitted into a dual inlet system for the highest possible precision. The second extraction line is a low-blank micro line that is for microgram-sized samples. 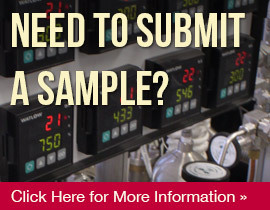 Samples are admitted through a GasBench interface and run in continuous flow mode. Samples can be cut out of thick sections (100 micron thickness) using a 213 nm UV laser system. Thermo Scientific Delta V mass spectrometer with a dual inlet and Conflo IV interface that is configured for compound-specific stable isotope analysis. The system includes a TRACE 1310 gas chromatrograph with TriPlus liquid injection autosampler coupled to a GC IsoLink II combustion interface capable of measuring δ13C, δ15N, and δ2H values in a variety of individual compounds including amino and fatty acids. This instrument is also equipped with a GasBench II that is primarily used for measuring δ13C and δ18O in carbonates and δ13C in CO2. Thermo Scientific Delta V mass spectrometer with a dual inlet and Conflo IV interface connected to a Costech 4010 elemental analyzer (EA), and a high-temperature conversion elemental analyzer (TCEA). 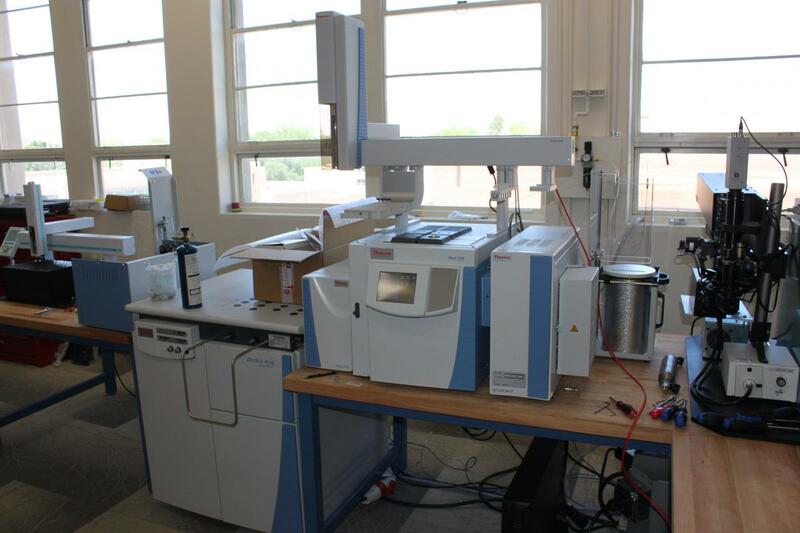 This instrument is the workhorse of UNM–CSI and is capable of measuring δ13C, δ15N, δ18O, and δ2H values of bulk organic substrates such as plant and animal tissues. Thermo Delta Plus XL isotope ratio mass spectrometer configured for CO2, O2, SO2, N2, H2, and CH3Cl. In the current configuration, the Delta Plus XL is coupled to a laser-florination extraction line and is used for δ18O and δ17O analyses of silicates, δ37Cl analyses, δ2H by CF-TCEA and δ34S by CF-EA-IRMS. Thermo Delta Plus isotope ratio mass spectrometer configured for CO2 and N2. In the current configuration, the Delta Plus is coupled to a Gasbench unit and a Costech ECS 4010 Elemetal Analyzer and is mainly used for measuring δ13C and δ18O in carbonates via both phosphoric acid with Gasbench-IRMS or laser ablation IRMS, δ13C in dissolved inorganic carbon (DIC), δ18O in waters by CO2 equilibration and δ13C and δ15N of solid samples by CF-EA-IRMS. 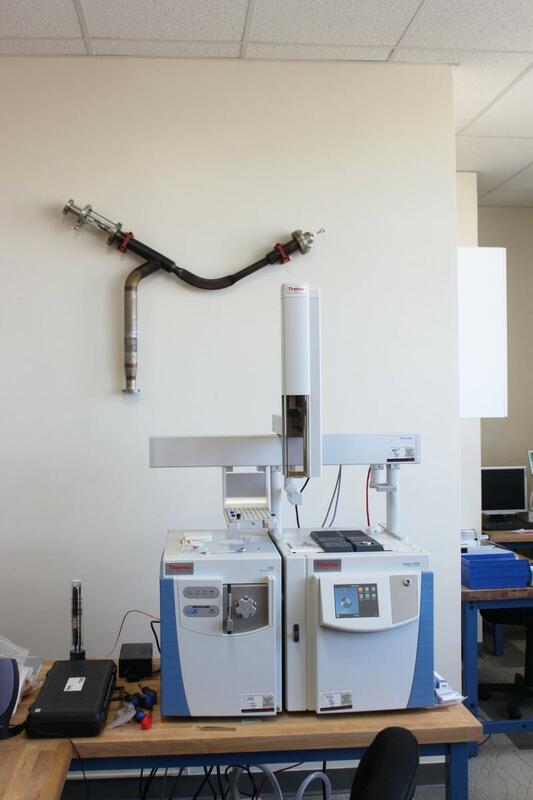 Finnigan MAT 252 isotope ratio mass spectrometer configured for H2, CO2, N2, O2, CO, and SO2. In the current configuration, the MAT 252 is coupled to the “in situ” laser-florination extraction line and is used for δ18O and δ17O analyses of silicates, δ18O by CF-TCEA, and δ2H measurements using conventional offline techniques. Picarro L1102-I Water Isotopic Analyzer for simultaneous hydrogen and oxygen isotope analyses from liquid water and water vapor in air. Thermo Scientific ISQ single quadrapole GC-MS coupled to a second TRACE 1310 gas chromatograph with TriPlus liquid injection autosampler capable of identifying and quantifying the concentration of unknown compounds using the 2014 NIST reference library.